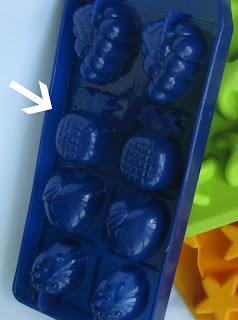 Remember those little pineapple ice-cube molds that I found last weekend? 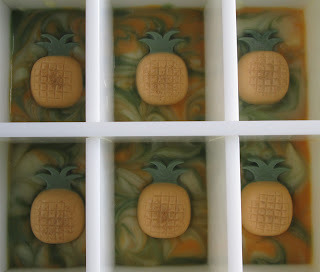 They worked like a charm, but then I was stumped as to what kind of soap to make for these pineapple embeds. 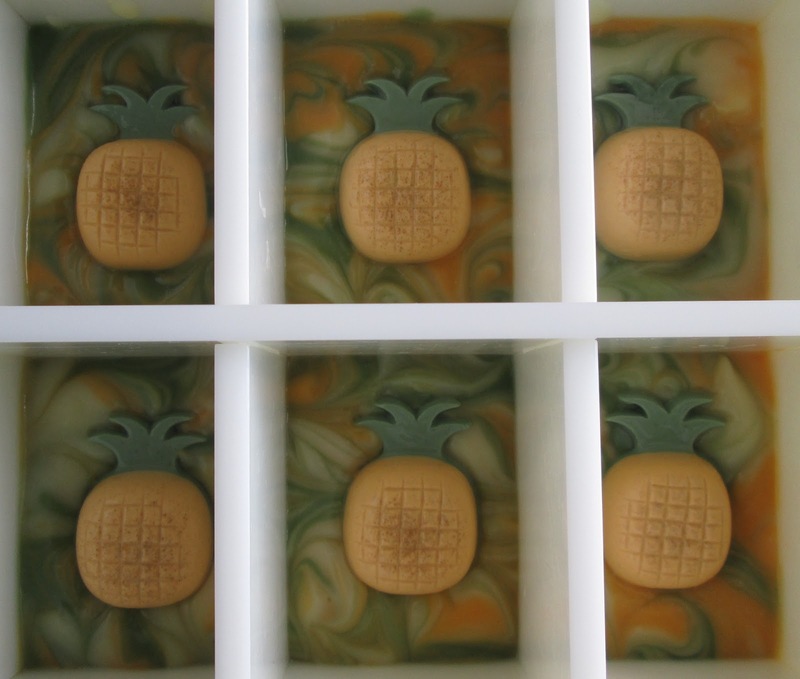 I knew I wanted to use aloe vera juice, and then I remembered that I had bookmarked Kendra’s (Amathia Soapworks) ‘Defying The Rules Of Soapmaking’ post several weeks ago. She breaks 3 rules of soapmaking with this 100% coconut oil recipe (and who doesn't love breaking rules?! ), and she uses aloe juice for the liquid...perfect! Normally anything over 30 or 40% coconut oil would be drying for the skin, but because this is superfatted at 20%, Kendra explains that it results in a hard bar with lots of lather that doesn't dry out the skin. This method would be very similar to the ones I've seen for salt bars - a high % of coconut oil with a high superfat. This soap sets up quick, so needs to be removed and cut within 6 to 12 hours. I used a divider mold and had no problems removing the soap. Happy Father's Day and hope you all have had a great weekend! Wow, sweet sweet soaps! Love everything about these soaps, the fragrance is to die for without any doubts! And Roxie is so cute! Thanks Nat, it's hard to get a good picture of her but she was cooperating so nicely yesterday! How on earth did I forget that you had tried this already?! 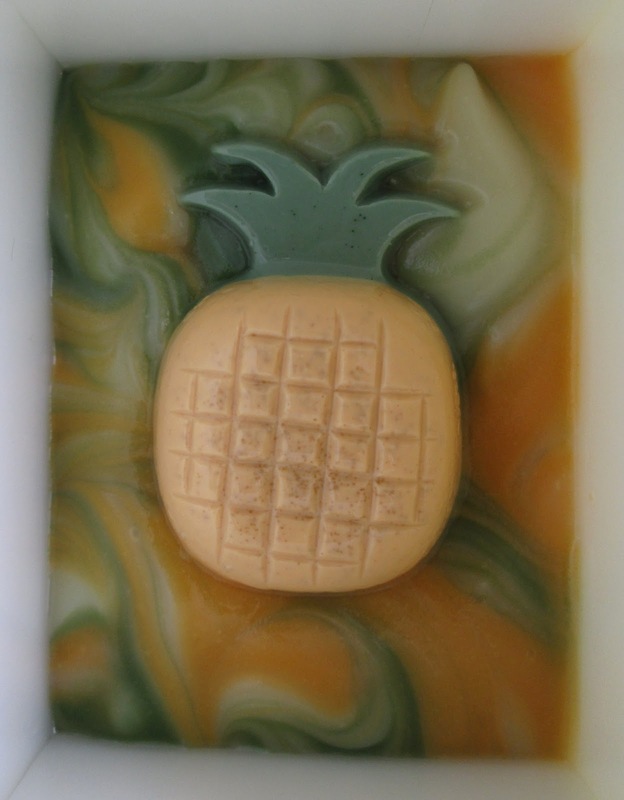 I'm so glad you have been enjoying your soap, I'm really looking forward to trying this one out! Love the tons of bubbles 100% coconut oil soap has. Wow,I love this soap! Looks perfect and the scent fits so well! It will be yammy experience in the shower! Roxie is super cute,looks like a child's toy! Thanks Maja!~ Roxie is quite funny because she will turn limp like a child's toy if you are holding her and she thinks you are going out to the car...I guess she thinks if she is quiet enough, that you will forget you are holding her and take her with you! 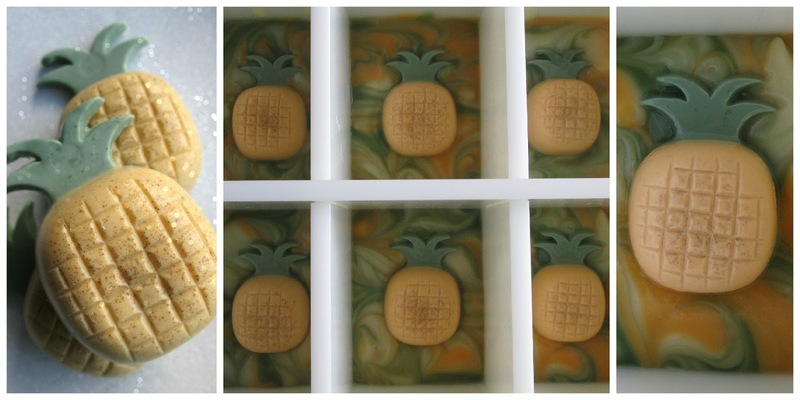 One day, when my soap making skills grow up, I would love to have this talent! Oh my gosh, how cute is that soap! I love the swirl. Bet it smells amazing. Thanks so much Dana, it does smell nice...very juicy! Beautiful soap and Roxie is sooooooo cute!!!! Roxie is so cute! 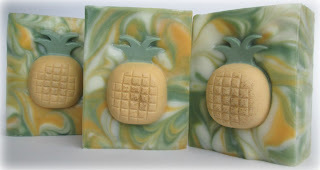 Your soap turned out gorgeous...I like EVERYTHING about it! I have a high coconut oil recipe to try next on my list. I've made one before, but made salt bars..this time I don't plan to add any salt. Good to know that I'll have some time to work with it..the salt bars moved along. Hi Kalla, I did only bring this soap to emulsion - not trace, before splitting it up to color, so I think that helped as well. Have fun, hope you get a chance to try it soon! 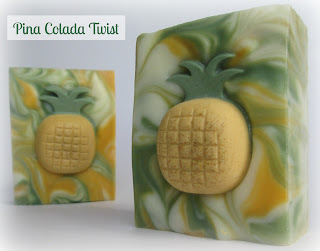 I'm always so impressed with your ideas - perfect color and swirl choice for a fun tropical soap! 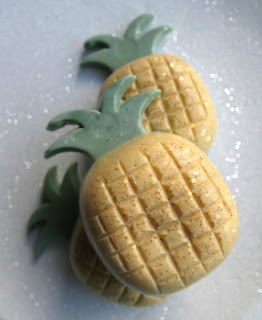 Glad to see the pineapples turned out so well!! Such grate color combination which perfectly fits to your design. I've never tried 100% coconut oil sopa before but I am really inspired now! Thanks Gordana, I'm really looking forward to trying this unusual soap! Como siempre fenomenal,haces unos jabones originales. Thanks so much for the encouragement Anne-Marie, I really appreciate it! 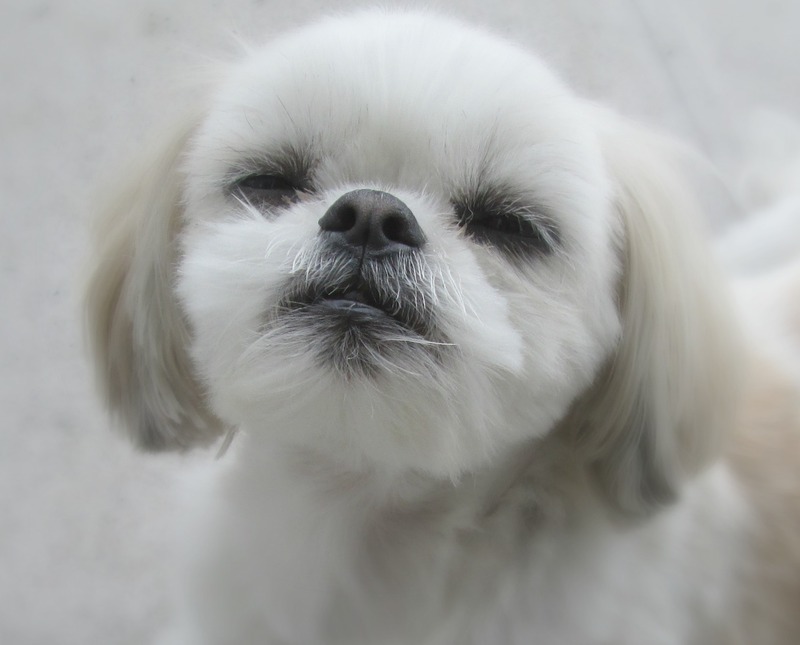 Aww, Roxie is adorable! Your Pina Colada soaps are gorgeous - I love the swirls and the pineapples are so cute. It's good to know that 100% coconut oil soap stays fluid for a while. I would have thought that it would get thick faster, too. I haven't tried 100% CO, but I've always been curious about it. I used it at 80% in salt bars with a 20% superfat and had great results. I imagine these would be similar, but the salt bars are still on my list of soaps to try...so glad to know you were happy with yours! Looks great, Cee! One thing to watch for with 100% CO soap is low temps! I used to think that it traced quickly but it was because I soap at low temps and I was hitting false trace. :) Figured I'd throw that out there for anyone who is looking at trying this! Love the little pineapple embeds! SO cute! That is very good point Kenna, thanks so much for sharing that tip! Awww!!! Roxie is adorable! the soap is not bad either. he he he. Just kidding. As always, beautiful soap Cee!!! I like you soaps alot, you are so creative! Your soaps look beautiful and your dog is so cute!!! These 3 researches from big medicinal journals are sure to turn the traditional nutrition world around!